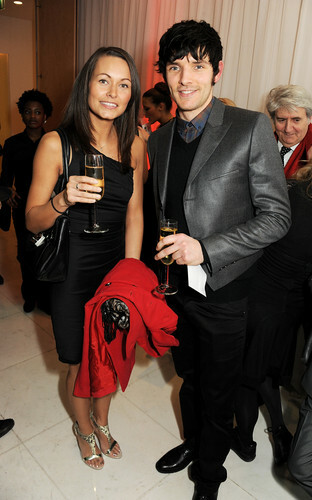 Colin at National Ballet Christmas party . Is this Colin's Girlfriend or wife? December 2012. HD Wallpaper and background images in the Colin Morgan club tagged: colin morgan colin morgan event party. This Colin Morgan photo contains business suit, well dressed person, suit, pants suit, pantsuit, suit, and suit of clothes. There might also be bare legs, pantyhose, skintight pants, skintight, three piece suit, and slack suit.